First climbed by J.A. Sim, V.J. Leader, K. Grinling, Dec 1930. From Shepherds Pass descend to the Frances Glacier and cross this to the West Ridge. Sidle round to the North Face, climbing this to the nick above the gendarme from where the northwest ridge is followed to the summit. 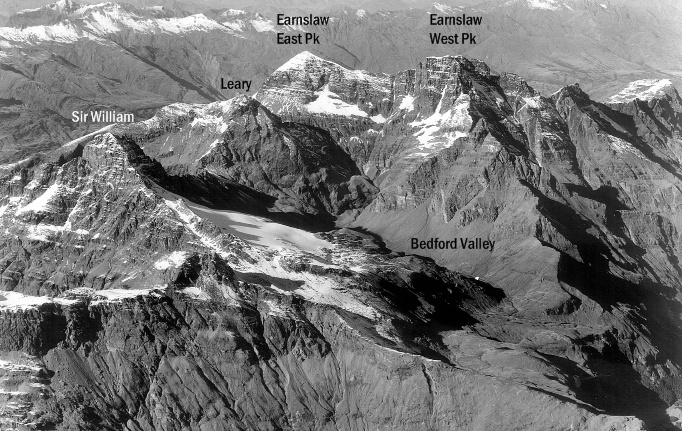 The Frances Glacier can also be easily reached from the Bedford Valley which provides a pleasant alternative from Wright Col to the sidle round the side of Leary. The North Face has been ascended all the way to the summit and a party has climbed right over the gendarme on the northwest ridge. From Shepherds Pass cross scree slopes to reach the Grant Glacier on the South Hunter face of the mountain. This can be ascended to reach the East Ridge which is followed to just before the middle of the three gendarmes. A horizontal traverse on to the North Face, which is ascended direct to the summit, avoids the buttress further up the ridge. From the West Hunter a variety of routes connect with those mentioned above. There are many variations possible in the above routes. Climb from Shepherds Pass. The first step is passed by a ledge on the Frances side and a chimney. The second step is passed on the South Hunter side and the third step, to reach the top of the buttress, on the Frances side again using the shelf running right across the mountain. The ridge is then followed just on the Frances side until another step presents the most technical climbing. Above this the ridge eases to the summit. G.N. Tunzelman and Bob Lidstone, 1963.